Getting into shooting stills and video kind of came out of necessity. In 2007 I started an online magazine as a way to help pay for my hobby. I bought a cheap Canon Rebel XT DSLR and used it to cover the races my audience would interested in. This was actually the stepping stone I used to also get into videography. When I started I had an idea about composition. I knew what looked good in my viewfinder, but I had no idea what aperture, f-stop or ISO was. I set the camera to sports mode and crossed my fingers I got the shot. Not having any formal training I began reading blogs and learning as much as I could. Understanding how your DSLR camera works is the key to great photos. As my knowledge grew I began to see the limitations of my camera and my lenses. I began to understand why professional photographers paid the money for a 5d mk ii and fast glass (that’s photog talk for lens). So I upgraded my camera to a Canon T1i. Still not a pro camera bit much better than the one I had. I also bought a 70mm-300mm lens which later proved to be a great investment. At this time I also saw a lot of videos related to my magazine’s subject on YouTube, and that’s how I got into shooting video too. I bought a really cheap video camera (I think an Apetek) because again I had no knowledge of what it takes to make great video. Being a solo shooter I had to come up with a way to shoot stills and video at the same time. I got the idea that if there was a way to mount the video camera over my DSLR then I could get my still shots and keep panning to get my video. I bent some aluminum into a shape like a photographer might mount a flash to and there I had my mount for my video camera (this was also before I knew about DSLR cages). This set up worked ok. I was getting good content for YouTube and the last race of the season my T1i got the dreaded "error 20" message on the LCD display. If you don’t know, this error happens and the shutter locks up on Canon cameras. You have to shut it off and turn it back on, then hope the shutter unlocks. To give you some insight into how this happened you first need to know what kind of racing I shoot. My magazine is dedicated to Off-road racing. If you haven’t experienced this before you would be amazed at the amount of dust you have to contend with. 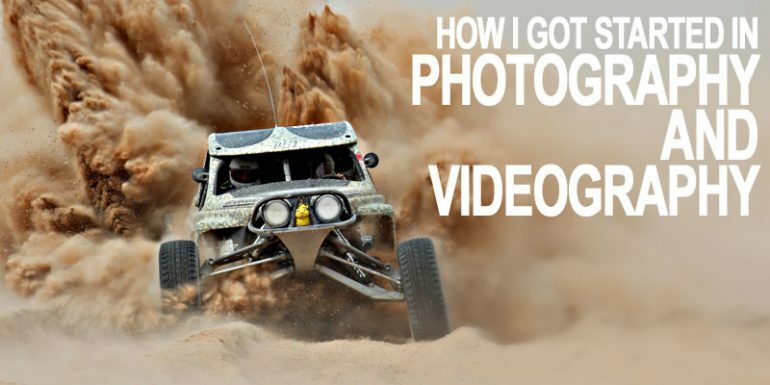 What do you expect, standing in the desert shooting trucks and buggies flying through the dirt. So one of the problems of cheaper DSLR cameras is they aren’t as sealed as a Pro DSLR. So no matter how much I cleaned the dust off the camera, too much got inside the camera and that was it. So time to upgrade again. This time I bought a T3i. I also upgraded my video camera to a Canon HF S20. Now the HF S20 was much heavier so my old set up did not work. So now I place my video camera on a tripod and then shoot my still shots. Shooting video from the same spot makes for very boring video, so now I will shoot some stills then turn to my video camera and concentrate on that, panning and jumping to new locations. My next evolution now has been DSLR video. It has its pluses and its minuses. Now I will set up my HF S20 on the tripod pointed in one direction, then place a GoPro somewhere on the ground close to the course then pan with my DSLR so now I get 3 different shots of the same action. Really makes for better video when you have multiple angles. I just bought Canon’s new 40mm pancake lens and a DSLR cage and rail system complete with a matte box and follow focus. We are now also shooting how-to videos, and the DSLR rig will help a lot. I also plan on getting Canon’s new T4i as a second camera. Shooting Off-road racing it would help to be able to change the focus while shooting. I can’t exactly ask the racers to back up and do it again. As of now I shoot wide landscape shots with my HF S20 since I can zoom out while I record. Even after 5 years I am still learning. Like anything, photography and videography constantly change with technology and someone might have a better way to create a shot you want for your photos or videos. So you see my entry into photography and videography came out of necessity and soon became one of my greatest passions in life. If you haven’t experienced the joy of getting that perfect shot, you have no idea what your missing. Pick up a camera and shoot something.